This image is dedicated to everyone who has suffered a loss in their lives. 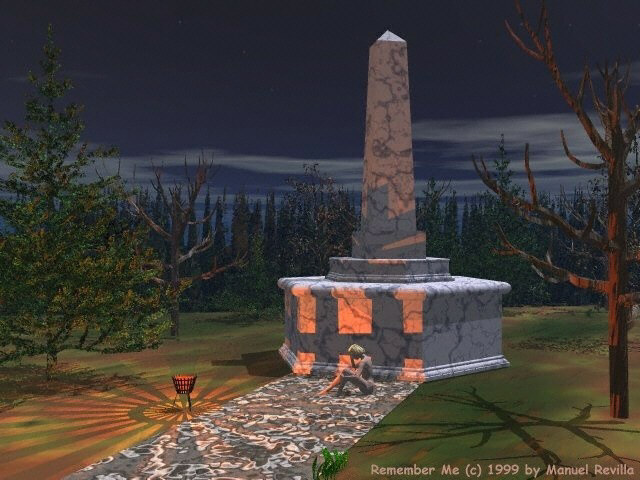 Through February 1999, I considered this the best 3D image in my portfolio. I hoped to show that 3D artwork can be more than just a pretty picture, that the 3D image could bring about an emotional response from viewers. Originally the woman in this picture had fairy wings, the tree in the right foreground had a bottom, and there where some additional minor details in the image. This was to much for the computer I had at the time to process and it kept crashing, so I was forced to "simplify" to what you see here. In April of 2000 I managed to re-create the image with all the detail that was originally intended and it can be seen by clicking the button labeled "Next" at the top of this web page. Some of you will prefer the new version, some the old, so both versions of the image will be kept. Remember Me is copyright 1999 by Manuel Revilla, all rights reserved.